St Andrews Cathedral Gallery: In 12th Century Augustian Cannons, extended St Rule's Church, all that remains today is a part of the chancel and the tower. 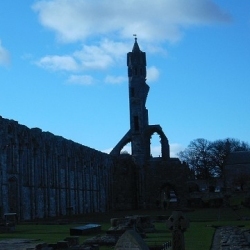 St Andrews Cathedral Gallery is a new addition to the Historic Sites section. The photographs were taken between the snow showers one very cold February in 2005. There is very little left of what was once Scotlands largest Cathedral, St Rule's Tower, over 100ft high, is open to the public and well worth the effort for the stunning views from the top.